Anna Bolton | Greene County News Greene County Career Center students use their laptop-tablet devices during class instruction March 7. XENIA — As a “pencil-paper person,” one Greene County Career Center senior was hesitant about the new one-to-one computer distribution when it launched at the beginning of the school year. But now as she gears up for college, veterinary science student Hailey Bowman feels like the easy access to technology has readied her for next year. The one-to-one initiative gave every student in the career center access to a laptop-tablet device. Bowman said she carries her device to every class, and then home every night — a practice entirely different from what was familiar to her. Many of her teachers use their devices to implement daily lesson plans — providing visuals, recording videos, allowing students to draw on their screens or write out answers. Superintendent David Deskins highlighted the importance of his staff utilizing “blended learning” styles, meaning the combination of traditional face-to-face instruction as well as online-based learning. For Brian Ropp, a math teacher, the initiative means instant feedback, automatic grading and going completely paperless. Ropp said when students learn partial lessons at home, that gives more time for interactive hands-on activities in the classroom. “That means class time is spent on assignments, activities and class projects,” he said. As a member of the technology committee, Ropp said the main motivation behind the change was preparation for students’ next steps in their education or career. “A lot of fields and trades require you to be skilled in the technology realm so we wanted to get a device for students to have in classrooms,” he said. Deskins continued the sentiment, which he said remains simply the mission of the school. “The focus is trying to provide advanced technology to students to ready them for the next step in life, to prepare them for college or Ohio’s workforce,” he said. Bowman will leave the career center for Sinclair Community College next year, but thanks to the computer she carries in her backpack, she’s already begun earning college credits. 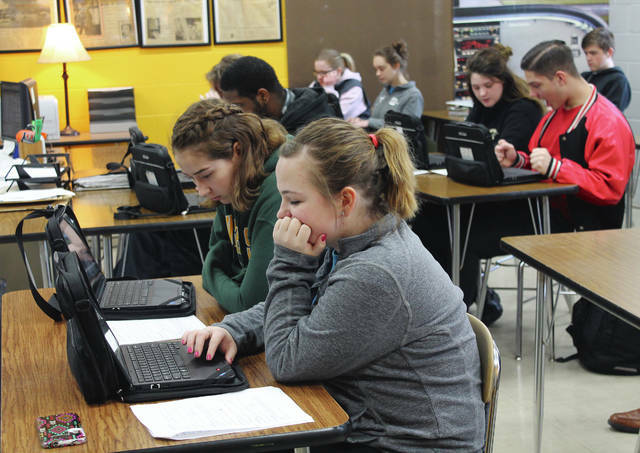 https://www.fairborndailyherald.com/wp-content/uploads/sites/50/2018/03/web1_GCCC.jpgAnna Bolton | Greene County News Greene County Career Center students use their laptop-tablet devices during class instruction March 7. Contact Anna Bolton at 937-502-4498 or follow @annadbolton on Facebook.